Lohit Telugu is part of the Lohit Fonts project. The project currently has fonts in these Indian languages: Assamese, Bengali, Gujarati, Hindi, Kannada, Kashmiri, Konkani, Maithili, Malayalam, Marathi, Nepali, Oriya, Punjabi, Sindhi, Tamil, and Telugu. 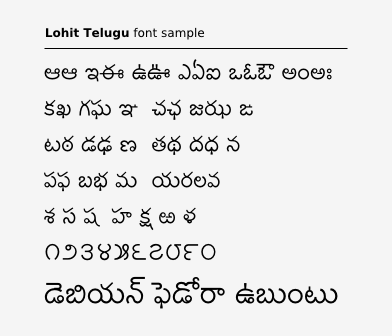 You can download Lohit Telugu and their other fonts for other Indian languages from their project page. Download. Click on the respective language links in “Binary” column to get just the font. Extract fonts from the archive (by james). (You might need a tool like 7-zip to extract from .tar.gz files.) After extracting, copy paste the font file(s) into fonts folder in your Windows. But thank you Veeven, for introducing Lohit font to me.